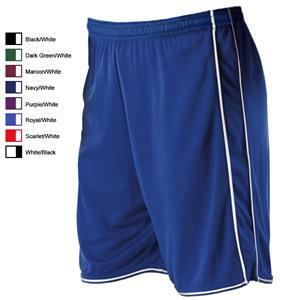 Alleson 506PTW Women's Softball Shorts. This short is made of 100% eXtreme microfiber Cationic colorfast polyester with moisture management fibers. This solid short features two rows of self-material with contrast color piping down the sides and 1" apart to match jersey neck. It also features one row of piping around the bottom of leg openings with v-notch sides, 1 1/2" covered elastic waistband with inside drawcord, and a 7" inseam. White shorts are double ply. Top Selling Item. This short is made of 100% eXtreme microfiber Cationic colorfast polyester with moisture management fibers. This solid short features two rows of self-material with contrast color piping down the sides and 1" apart to match jersey neck. It also features one row of piping around the bottom of leg openings with v-notch sides, 1 1/2" covered elastic waistband with inside drawcord, and a 7" inseam. White shorts are double ply. Great shorts actually bought them for the gym. They feel nice and looked great. I am 5'5 130pds and the small are a tad baggy, but I like the loose feel of the legs. Wash and dry nicely too! Fast shipping. I love the part. The price is awesome. My daughter loves loves loves these shorts. I ended up buying her 2 of the same color and a few more colors. Great for Basketball. The length is great (hit's right at her knee)Very comfortable.